Compensators were generally avoided when I first got involved with the AR15 platform. During the assault weapon ban, they were the only legal muzzle device available, and they had to be pinned in place. Loud, obnoxious, and somewhat uncool… many shooters just preferred to go with a neutered muzzle. Fast forward to the AWB sunset, and suddenly everyone was wanting a threaded barrel and a flash hider. Compensators were blasé and unnecessary. In truth, the compensators of old were obnoxious and not very effective compared to the modern designs. Ten years of research and development has led the market to some compact and effective muzzle devices that vastly improve on the older designs in both weight and size. So what is the science behind compensators and recoil mitigation? How did the designs come full circle to reduce both flash and recoil? First a brief summary of the basic flash hider. 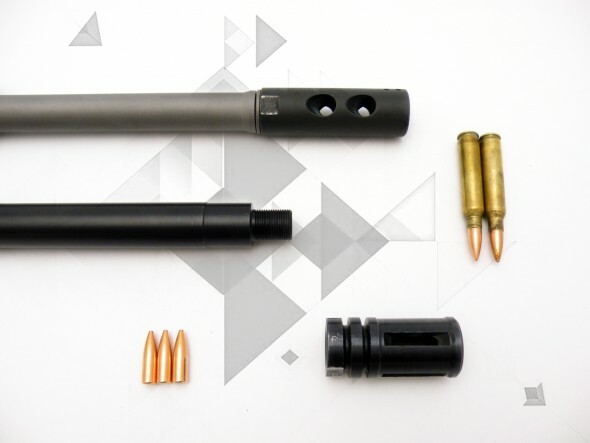 A summary of how a flash hider reduces the flash is as follows: basically the movement from a supersonic high pressure gas to a subsonic low pressure gas can cause an extreme rise in heat and consequently, can cause combustion of any remaining unburned powder. For a more technical explanation, please head over to Vuurwapen Blog and read up on Robert Silvers explanation. Thus what a flash hider attempts to do is to redistribute streams of gas from the source (the muzzle) to a wider area of dispersion, thereby lowering pressure and, as a secondary effect, lowering the heat of the supersonic / subsonic gas transition. This keeps unburnt powder from igniting and thereby reducing muzzle flash. So now that everyone wants a device that both mitigates recoil and reduces muzzle flash, how do modern compensators best carry out principles that can oppose each other? A compensator works by allowing propellant gases to push against a baffle or set of baffles which adds force to the muzzle of the gun. As the gas exits the bore at high velocity and pressure, it is looking to expand and drop from a high pressure environment to atmospheric pressure. When it encounters a baffle, it is suddenly forced to redirect its expansive volume in a new direction and it generates force as it pushes against the baffle or baffles. A 10-year-old Bushmaster Y Comp: Compensator designs have come a long way since the 90s. While a strong comp, this design is unnecessarily heavy. You can’t give these things away. One of the important aspects of consideration is that gas has both pressure and volume. Powders also have unique burn rates. As many studious competition shooters in the IDPA world have noted, you want a light bullet with a slow burning powder behind it to achieve the highest possible recoil reduction. A slow burning powder will continue to burn after the bullet has left the bore, and it will continue to expand out the muzzle for a longer period than a fast burning powder. The powder that continues to burn after the bullet has left the bore is still expanding out the bore and pushing on your baffles. The more gas your gun creates, the more recoil reduction. As the devices have evolved, manufacturers have refined the compensator to offer some scary effective designs. Right now the two highest rated muzzle devices known take the baffle principle to another level by letting gas do more work than simply striking one or two flat baffles. The Precision Armament M4-72 shows a fantastic level of recoil reduction and is TTAGs recoil reduction champion, beating out many dedicated 3 gun compensators. Note the aggressive angle the baffles. The #2 compensator on the TTAG test, the Doublestar Arms Bullseye, uses a similar angled baffle stack. The Aggressive M4-72. Note the baffles angled to the rear. No doubt one of the key reasons this compensator is purported to be so effective, even beating out dedicated 3gun comps in the TTAG comparison. It bested the JP recoil eliminator, the Jerry Mikulek Compensator, and every other device in the 5.56 atmosphere all while being small and lightweight. Todays combo devices attempt to deliver both recoil management and flash reduction. This poses an interesting design challenge as the concepts of flash reduction and recoil management can pose significant problems, as several of the key concepts are in opposition. Combo devices were not around at the sunset of the assault weapon ban. These devices evolved based on fierce competition from many manufacturers searching for a device that does all things well. If you want to reduce flash, you want to cool gases and reduce pressure. If you want to control recoil, you want gas volume directed towards a baffle to negate some of the recoil energy of the rifle, but this doesn’t necessarily cool or redistribute the gasses as efficiently as a flash hider. So combining both efficient gas redistribution for both recoil management and flash suppression can be an interesting engineering problem and the sheer variety of devices available display many manufacturers searching for perfection. The Griffen Armament compensator: A variant of the ever popular “battle comp” type combo device. These devices are basically single chamber brakes. Arguably, the marketing behind the “battle comp” is what spurned the development of new combo devices en masse by manufacturers. Around 2010, the battle comp started making rounds. This device promised to be both a effective recoil reduction and flash suppression muzzle device. It had some great marketing, I will give it that! These “battle comp” designs and similar devices all have the effect of reducing recoil, but I think this may be a dead-end on the evolution of muzzle brakes. They are similar to single chamber brakes with heavy porting. Devices similar to the battle comp come in at the middle of the pack in regards to recoil reduction. Many of the competing designs today utilize a combo of the two stage brake and pronged flash hider. The Vg6 Epsilon is a good example of one of the many modern iterations of the flash hiding compensator. It features the three prongs of a traditional flash hider, two flat baffles for pressure redistribution, and upward venting for additional muzzle rise mitigation. I would like to test it, but I don’t have one at this time. Most of these devices seem to have the same muzzle signature (or at least, very similar signatures) with the majority of the flash observed at the first baffle. Will manufacturers be able to engineer away the flash while giving us the same performance of the established two / three baffle brakes? I bet they will. Lots of choices on the market. I am happy to have the opportunity to try the M4-72 out and will give you my full thoughts on that device once I have some range time with it. I have only been warming up to the idea of compensators and combo devices recently, but the performance of the devices as highlighted by TTAG made me want to re-evaluate my bias against muzzle brakes. I had been disappointed by older designs such as my Cav Comp and Y comp, so jumping into the Griffen Armament comp and now the M4-72 should give me a better taste of what modern designs can do. I will be trying a Vg6 Epsilon or perhaps the SI J-comp as they scored well in the testing by TTAG. Reducing recoil to maintain fast follow-up shots up close and being able to call the shot through the glass when shooting at a distance are appealing to me, so let’s see where this goes.